I hope you all had a nice Thanksgiving. We spent a quiet day at home, eating and watching the Titans crush the Lions. :) Holidays will never be as joyous as they were when Sahara was with us, but she's always there in spirit. 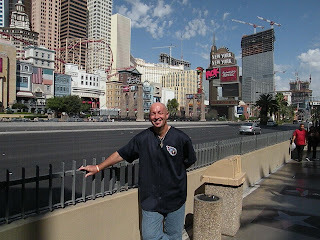 I need to back up and post a bit about our trip to Vegas in October. We had so much going on that I simply got sidetracked and forgot to say anymore about it. We had a very nice anniversary vacation. It was sunny and hot, just the way I love it!!! We stayed at Planet Hollywood, which is now one of my favorite hotels. It was wonderful from beginning to end. While we were there, I took Shannon to as many places as I could, trying to hit all of the spots that Sahara loved so much...the Krispy Kreme factory at Excalibur, the walkways of New York, New York, the MGM, with the lions and Wolfgang Puck's, M&M's World, Caesar's Palace and the Forum Shops, Treasure Island and the pirate show, Hamada, the Fashion Show Mall, and just some good long walks on the strip. I love Vegas. I feel good when I'm there. So many good memories, good friends, good food and good times. We enjoyed spending time with my dear friend Packy and her boyfriend Gregg, and her sweet mom even joined us for breakfast one day! It was so great to visit with them and we had some wonderful times. 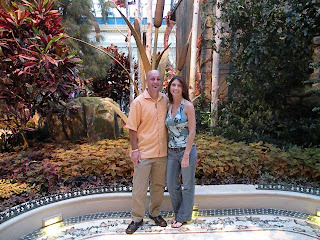 We were also able to take in a couple of shows, "KA" at MGM and "O" at the Bellagio. They were both great and I highly recommend that you see them if you get the chance! And if you want to see the most beautiful flowers and holiday decorations, the Bellagio is the place to be. It defies description. Just go! 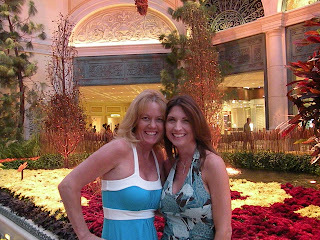 Unfortunately, time always passes too quickly when you're in Vegas. Our three days went by in a flash, then it was time to fly back and get back to work on the benefit concert! Our next goal: to be someplace warm for Christmas!